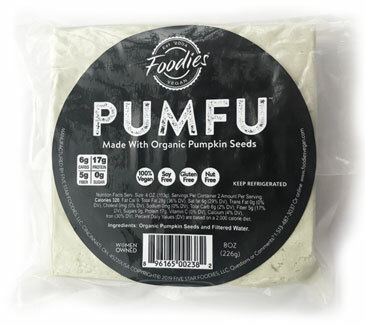 Pumfu is a remarkable, protein rich tofu alternative made using only pumpkin seeds and water that's organic, GMO-free, soy-free, nut-free and gluten-free. Pumfu marinates well and is very versatile, and can be used for sandwiches, stir-frys, scrambles and even desserts - anywhere you'd normally use tofu, Pumfu is the perfect replacement. With 17g of plant based protein per serving, Pumfu is very satisfying for all diets - give Pumfu a try and it’s sure to become your go to plant based protein! 8 oz. (226g) packages are $5.99 each.